So, you have a couple of vinyl records lying around and you'll like one of the best record players under £100 to upgrade the current one you have. If that's the case, we have provided a list of the best record players under 100 pounds with built-in speakers, amplifier, and turntable. Despite the technological advancements from vinyl records, tapes, CDs, to digital music,vinyl records have made a big-time comeback. One may way to say the past doesn't stay buried! Although you can download digital music on your smartphone, iPod, PC, as with several other devices, buying a physical record is one more way to financially support artists as well as record stores. This is a yearly event where artists, music labels, and record stores collaborate to create one-off vinyl releases and it began in the US in 2007 with organizers from the US, UK, Mexico,, Australia and across Europe. And if you've bought a record, then you'll need one of these players that have also been equipped to produce superb audio quality in your home, office, or business. Just imagine reliving the musical experience of your grandparents while listening to a country music or contemporary song from a record player that does not compromise the sound quality from the original recording. Much more, these turntables are not outdated or anything of the sort given the high-end features some of them come with as with their reputable manufacturers who have built them. You'll also find budget-friendly record players that can provide excellent audio quality as would be expected of even the world's best turntable. They are portable, can give enhanced sound quality, and can even record to a PC via USB which will enable you to convert your vinyl music to digital music. These are the types we have chosen to review to serve as a buying guide for getting the a cheap record player with an acceptable level of performance. So, if you're just trying out record players for the first time and would like to get a feel of their mode of operation or if they're any good, you might want to settle with one of these. Keep in mind that a more expensive one might require a top hi-fi system to work with is and as such, may be adding additional cost. What is a Record Player? How do Record Players Work? How Were These Turntables Selected? A record player also known as a gramophone or phonograph, is a mechanical machine that can reproduce the sound stored on a cylinder or disc called vinyl. The major components of this device are a loudspeaker, amplifier, and turntable. Thomas Edison, the grandfather of modern record players, was the first to develop the phonograph in 1877. The surface of a vinyl record has a spiral groove that has been engraved with sound vibration waveforms. When you place the record on the platter or turntable, the turntable starts spinning the record at a constant speed of 33, 45, or 78 revolutions a minute. Next, a playback stylus attached to a phono cartridge and tone arm slides along the groove of the vinyl record which has tiny peaks and valleys (wavelike form) representing music in digital data form. The stylus vibrates according to the undulations in the groove and then the vibration is converted to electrical signals that are amplified and later recreated in form of sound by a speaker. The stylus as well as the amplifier and speaker can pick up sound as the record spins on the turntable. You might not need to plug the record player into a hi-fi system or Hi-Fi or sound set up to enhance its sound. The major difference between a record player and a turntable is that the former is a single unit that consist of both a turntable, amplifier, and a wireless speaker. On the otherhand, a turn table is the major component of a record player that does not come with any phono or power amplifier. For this reason, you may have to buy its own amp and speaker in order for it to reproduce sound. You can buy a turntable alone since it is a standalone unit, but a record player will consist of other components all of which combine to form a standalone unit. Most record players are portable and come with a light weight.They even have cases that makes them transportable with ease. On the other hand, the same cannot be said for a turn table. On first thought, you might wonder why you should take some steps into a few decades back and buy a record instead of a CD or even stream some good songs online. Now, the record player has a strong contender given that digital music offers clear and crystal sound and may even allow you select the format you want your song. In line with that, it may be more convenient to play songs and even gain access to them given that all you need is your smartphone, PC, or Tablet. So, why should you dish out that valuable cash of yours to buy a record player in 2018 when you're already enjoying these benefits and even more from a CD or digital music. 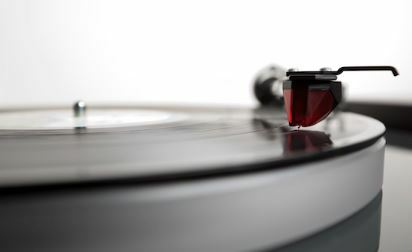 Although most people have argued that digital audio sounds better than analog audio, they have not attested to the fact that a playing vinyl record can be comforting. You can sip a glass of wine, have a date around with cool and warm audio sound resonating in the background. With a physical record, you can show off your amazing collection by placing them in your living room. It can be exciting to know that you have some of the greatest songs ever made and show them off as a trophy on the wall. The artwork on these records can also enhance the decoration of your room and there's no how you'll accumulate them without having a record player. 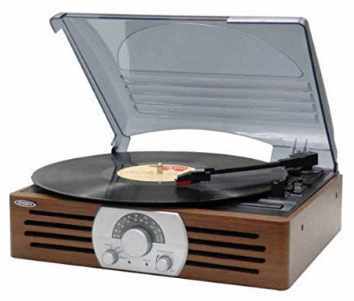 Some record players come with a USB port or inbuilt Bluetooth which will enable you to digitize the records. That is to say, you can convert the sound in the record to digital music just by connecting via USB to a computer or via a wireless connection, and then transfer the songs to your PC. This may be beneficial if you have alot of records lying around and would like to also have them on a more portable device. Whether you want to listen from your PC or smartphone, you can do that without having to download your favorite tracks again. Here's the part where we show you the Best Record Players Under £100 which are easy to use due to their plug-and-play turntable. They have pre-fitted tonearm and cartridge, can offer decent sound quality and come with an affordable price tag which makes them the best buy especially if you're just testing the waters. 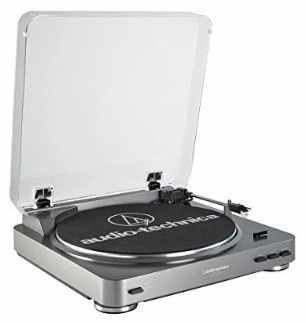 The first record player under £100 you'll want to take a look at, is the Audio-Technica AT-LP60 USB. On several reputable review sites on the net, they won't fail to mention this guy not only because of its exceptional performance, but its cheap price tag of £99. This phonograph was designed and manufactured by the Japanese company, Audio-Technica Corporation. We've seen Wireless Lavalier mics, open back headphones, and now, a record player. If you want a brand name that has experience and knows their beans, then you might want to settle with them for your next record player. The AT-LP60-USB stereo, is designed with a removable hinged dust cover to shield it from dust and keep it looking radiant at al time. For its build, it has a dimension of 3.84 x 14.17 x 14.02mm (H x W x D) and it has been solidly build to stand the test of time. The AT-LP60-USB, has a belt-driven turntable which means that an elastic belt connects the motor to the platter. As a result, it will tend to be quieter and not make the phonograph misread the sound due to vibrations. This also translates into a more natural sound than a direct-drive turntable where the motor is directly connected to the platter. According to its maker, you get an increased clarity and high-fidelity audio. This is an automatic turntable which automatically places the stylus on the record and will reduce the chances of the record damaging. Inline with that, the tonearm is automatically returned when the record ends and the turntable supports both 33-1/3 and 45 RPM records. Additionally, this machine has an anti-resonance die-cast aluminum platter and an integral dual magnet phono cartridge with a replaceable diamond stylus. You;ll also find a inbuilt switchable phono pre-amplifier with RCA output cables that can be used to connect to a loudspeaker. Although the phono preamp is built-in, you can still change the stylus if need be. To enable digitize records by transferring them to a digital device such as a Mac or PC on a direct connection, this record player comes with a USB port. For its sleek design, price, and audio capabilities, the 1byone Belt-Drive 3-Speed Stereo is one of the best record players under 100 pounds. For about £39, you can be a proud owner of a one of the most afforable vinyl record player with speakers. 1byone, is a US based company that specializes in the design and manufacturing of smart home electronics accessories. This entry level record player has a wooden finish which gives an admirable design. Consequently, if you want something that can give take you down memory lane to the 60s and 70's, this would be it given its outlook. To protect the internal components from dust, it comes with a dust cover that has been combined with the front cover. Its controls are easy to use and the device is portable enough to be to moved around the house easily. The 1byone Stereo, features a Belt-Drive turntable that uses an elastic belt to connect to its motors. Since vibration is minimized, you can expect good sound quality because the belt acts as a shock absorber which helps to dampen the vibrations that may be resonating from the motor. You place a vinyl record on this turntable which has a selectable RPM speeds of 33 / 45 / 78, thereby giving you more control over the speed of the record being played. This is a vinyl recorder that can digitize analog sound and store them as MP3 files as such, you can have your recording on your computer. All you have to do, is insert a USB key whose capacity is not greater than 32GB into its port, and then press record. Thus record player comes with an auto stop feature that automatically stops the record once it has finished playing. This takes away the need to do so yourself especially when you're engrossed with something else. These are two front-facing 1.5-watt speakers that hold a promise of delivering consistent sound levels. On the otherhand, its manufacturer have stated that power to the speaker has been limited in a bid to maintain the high quality sound. You may need to use an external speaker to amplify its sound. Another record player with a natural wood finishing that can offer quality sound, is the JENSEN JTA-222 3-Speed Stereo turntable with am/fm stereo radio. Offered at a price of about £79 on Amazon, you can also buy it from eBay, Walmart, and Bestbuy ($43), to get a feel of how a record player works. The Jensen JTA-222, is one of the record players designed and manufactured by the US based company, Spectra Merchandising International, Inc.
As already stated, this device has an antique wooden case design with a diamond shaped stylus which makes it a music player that will tend to blend into your home's decor. This wooden design gives it a compact build and its dimension of 5 x 12.5 x 11 inch (H x W x D) will allow you to store it easily on a shelf or table. To prevent dust from mounting on the turntable and keep it safe while at the same time protect your records from any potential damage, there is a transparent dust cover attached to this record player. You'll find an FM stereo indicator and Power indicator at its front to serve as an indicator when the radio is turned or the system and also Front-facing built-in speakers to give a more direct sound. For the JTA-222 3-speed turntable review, this mechanical device supports 33 1/3, 45 and 78 RPM records to provide flexible playback options. Thus, every record in your collection place on its platter can be played given that the jensen jta-222 needle will begin to recreate its sound. It also comes with an AM/FM stereo receiver which makes it possible to play the radio and tune to your favorite station if you choose not to load the platter with a record. Whether you choose to listen to a record or the radio, its two built-in speakers can deliver an appreciable sound. Inline with that, the RCA audio output jacks on its rear will enable you to connect this record player to a home stereo system to deliver a more amplified sound. 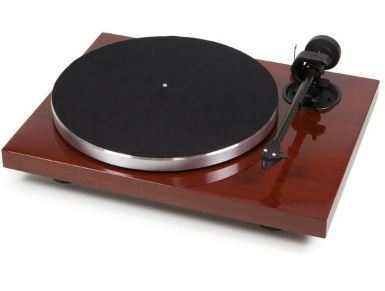 The is one of the best affordable record player with built in speakers given its price tage of about £69.99. This record player is designed by the ION Audio, a manufacturer based in Cumberland, Rhode Island, United States. The Max LP is a turntable that comes with its own speakers. 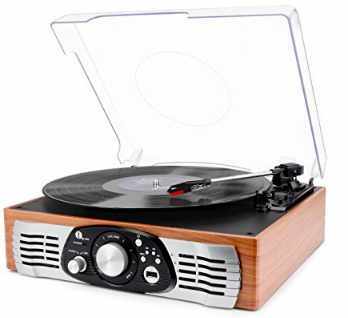 Like the Jensen JTA-222 3-Speed Stereo, this is a Wood Turntable that has a portable size. You can place it on a shelf or table without it looking out of place and you can move it about with ease. There is a transparent duct protective cover fixed to this turn table to cover it especially when it's not in use. This turntable supports 33 1/3, 45, and 78 RPM playback speeds to enable you control the speed of the record. Your records can also be transferred to a Mac or PC since there is a USB Output on this device to convert vinyl records to digital files. This can be made possible by connecting the record player to your computer via USB and its Tape Converter software on the CD will automatically separate the tracks into individual files. That being the case, you can have your favorite tracks with you without the need to download them again on a smartphone of computer. There it has standard RCA outputs and a dedicated headphone output, that will enable you to connect this record player to an external speaker in order to get a high-quality sound or to a headphone for a private listening. Even without connecting to a sound system, its inbuilt speaker can still deliver decent audio quality. While these speakers are small, an upside to their size is that it will prevent the stylus from picking up vibrations that may affect audio quality. 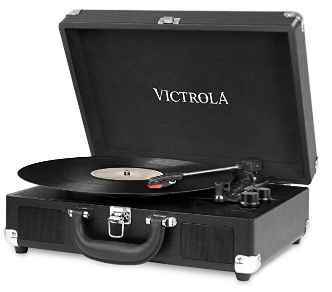 Here's the Victrola Vintage 3-Speed Bluetooth Suitcase Turntable with Speakers with just a price tag of about £47. It is one of the cheapest all-in-one music player on the list but that does not mean its not any good. Victrola is another popular brand like Audio-Technica and it is owned by by Innovative Technology, a US based company that focuses on designing and manufacturing Acoustic Phonographs. Unlike the aforementioned record players, this is a portable device that is easily transportable. This is because it is built to look like a suitcase and as such, you can easily pack it up and hit the road if need be. It is a very convenient device to travel with given its build with a carry handle. There's also its chrome accents and textured exterior to look forward to, hence this device has an appealing look. The VSC-550BT-BK, is a 3-Speed Turntable that can spin at a constant speed of (33 1/3, 45, 78 RPM) to suit your needs because you can control the playback speed. It comes with a Bluetooth that will enable you to wirelessly stream music from a Android or iOS smartphone, Mac, PC or any other Bluetooth enable device. As a result, your favorite songs on your phone or PC can now be played through its inbuilt speakers. You won't have to rely only on vinyl records before you can take advantage of its audio capabilities. You can stream music from a range up to 33ft, which means that your audio source can be a distance away from this record player without a break in transmission. On this music player, you also get a RCA jack and headphone jack that will enable you to connect to a sound system for a more enhanced sound quality or an headphone for a private listening. How Were These Record Players Selected? There are several record players under 100 pounds and each comes with its own perks and downsides. Nevertheless, some are better than others and can give you great value for your money. Therefore, the following were our utmost considerations while selecting only 5 budget record players out of many. Since we are mainly focusing on the record players under £100 on Amazon, price was a limitation to how far we could select. In other to prevent the phonograph from misreading the sound and maintain high fidelity, a the turntable must be well damped to prevent internal and external vibrations. One way this is made possible is with the use of certain motor configuration such as a the connection of the motor to the platter using an elastic belt. For our selected record players, they feature a Belt drive turntable instead of a direct-drive turntable in a bid to eliminate vibrations that may affect sound quality. When the tonearm of the record player can move automatically when a record is placed on the platter, records can easily be played. Thus, a record player that operates automatically will take away the need to manually lower the records and reduce the chances of damaging the record. Inline with that, we have selected record players that meet this requirement. A record player with either a USB port or a built-in Bluetooth record player will enable you to transfer records to a computer. 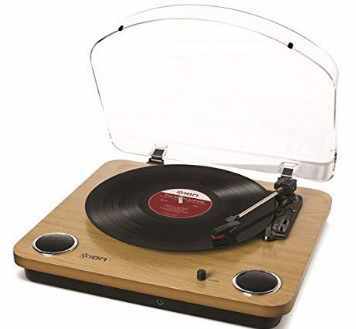 For this reason, our selected record players under £100 have one of these which will enable you to digitise your records. At a latter time, you can lsiten to them from a computer or any digital music player. As is usually the case, we do not neglect the reviews on verified buyers on Amazon to ascertain the levl of performance of each device and also know its downsides. This way, we can determine if it is a quality device that can give you a run for your money. Consequently, these products have high ratings and have been reviewed by hundreds of people using the same device, hence you can trust their judgement if not ours in. Having reviewed the best record players under £100, you can use this guide to find an inexpensive record layer that can still deliver an impressive audio quality. If you are in the UK, US, Australia or Canada, each of these players can be bought from Amazon, walmart, eBay, as with other reputable e-Commerce sites. Do you want to relive te musical experience in the 60's, 70's? Then take the next step to buy the best affordable record player with built in speakers.